Using a multi-tiered system of supports to teach social and emotional skills in elementary school. Multi-Tiered System of Supports (MTSS) is an umbrella framework that includes Response to Intervention (RTI) and Positive Behavioral Intervention and Supports (PBIS) frameworks. P.K. Yonge uses this tiered system, where every student receives core instruction, known as Tier One. Some students need supplemental instruction, which is referred to as Tier Two, and a small cohort of students receive the most intensive intervention and supports, known as Tier Three. This tiered system is used for academic supports as well as behavioral. "If a child is not behaving there’s a need not being met, and that’s the premise I always go on." The school worked to create a core culture of what students and teachers should expect for student behavior. There was a need for a consistent language and way of treating one another. Addressing students’ social and emotional needs gives all students the opportunity to thrive and succeed in school. These behavioral supports are integrated with academic supports in the MTSS framework. 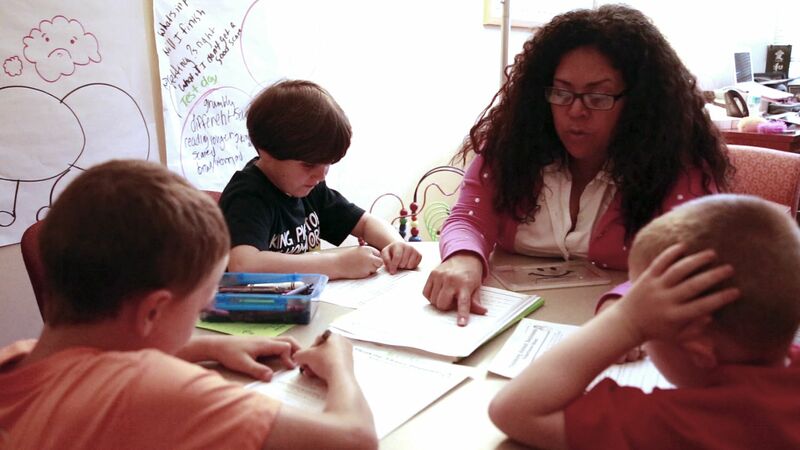 See how this school provides academic support for every student. The Student Success Team (SST) makes all decisions about tiered support. The team is made up of the K-12 MTSS Support Specialist, the Learning Community leader, all of the core teachers, administrators, guidance counselors, speech and language pathologists and sometimes occupational therapists. Additional people are brought in on an as-needed basis, and parents are informed and consulted on all decisions. The SST meets every four and a half weeks across K-12. Creating rating scales with the School Psychologist that may give some input on how the child is doing. None of the assessments are exclusive, but used together they can give a better picture of how the intervention is helping a student, or whether additional support is needed. All K-5 students receive Tier 1, or core instruction, for social and emotional learning. Every morning teachers have a morning meeting with their group of students. During morning meeting, teachers do a go-around check-in with students, use a common and consistent language around behavior, and address any classroom issues. In addition, every Wednesday morning, the whole learning community (two grades combined, K-1, 2-3, 4-5) has a large morning meeting where a specific topic, such as bullying, conflict resolution, or friendship is focused on. Teachers use the Second Step curriculum, which helps teachers instill social and emotional skills with elementary age students through stories, lessons, and activities. For Tier 2 support, students are identified in the SST meetings that happen every 4.5 weeks. Tier 2 groups typically consist of 2-4 students, grouped by a common need/topic rather than by grade. Groups can be focused on friendship, divorce, grief, testing anxiety, body issues, etc. Students are pulled out during their lunchtime, not during academic subjects such as reading or math. If students have been in Tier 2 for more than 9 weeks, they can be moved to Tier 3 support. Tier 3 is primarily one-on-one time with the Guidance Counselor. This is done through both pushing-in to the classroom and pulling students out during lunch time or an elective. If a student is working on a particular skill with the counselor in her office, then it makes sense for her to work with the student in the classroom. As P.K. Yonge’s Guidance Counselor, Ritzy Ettinger, says, “Those kids that I’m pushing in with I also pull them out. We practice some of those skills and then I go in and I help them in the classroom.” If a student can do something successfully in the Guidance Counselor’s office, then they can try to do that in the classroom with the Guidance Counselor’s support, and ultimately this can lead to doing the successful behavior in the classroom on their own. This way the skills they work on in the Guidance Counselor’s office can also be realized in the classroom. In a one-on-one session, students will work with the Guidance Counselor on different exercises and activities. They will also rate themselves on where they are at around a particular skill. There will be a series of pre- and post- check-ins with students along the way, some kind of evaluation that the student participates in so the Guidance Counselor knows that the student is understanding the message or the skill they are practicing. One of the things P.K. Yonge has worked hard on is to reduce the labeling and stigmatism that can go with being identified as a student who needs more support. Some of that normalizing and making it safe comes from the ways in which they try to balance "pushing-in" and "pulling-out." Another strategy has been a 'lunch bunch' group. According to Ashley Pennypacker Hill, MTSS Support Specialist, they ask a child to lunch. She asks, "Are there some people that you would like to join you? Are there two friends that you would like to join you so we can talk about friendship and you could practice some of your friendship making strategies with these two friends?" Often they then bring two friends to lunch. "They're receiving Tier 2 support and they don't even know it. They just think that they're getting to have lunch with the guidance counselor, talking with their friends." The Guidance Counselor also has a central location and open door policy in the school, so students always feel welcome to stop in and ask a question or get support, anything from getting a safety pin for their clothes to talking about something difficult that happened to them. P.K. Yonge strives to create a culture of support and safety, making it seamless and normal for all students.